THE SATISFACTION of hitting a target at long range with a bullet is as pleasurable today as when I was a barefoot boy and threw a well placed rock down by the creek. But instead of just picking up another rock and letting it fly, long-range shooting requires close attention to handloads to produce consistent velocity and accuracy along with the best shooting form to take advantage of those handloads. Steve Johnson, of Hornady, said that would-be long-range shooters should concentrate first on an accurate rifle. "The best bullet with the best load in the world isn't going to shoot all that well unless your rifle is capable of good accuracy," Johnson said. "That means the barrel is square with the action, the (chamber) neck square with the chamber, the locking lugs bear evenly, and so on." Preparing long-range handloads is all about consistency and concentricity, Johnson said. How well that goal is met depends on how meticulous you are. "Some handloaders make sure all their primers, brass, powder, and bullets come from the same lots," Johnson said. "From there, they'll sort cases by weight, bullets by exact diameter and concentricity of their jackets, and scale out every powder charge." My friend Steve Johnson is not just a pretty face or a friendly voice on the telephone. He's a man who's worth your careful attention. Years back, when Hornady decided to start all over, from scratch, and completely redo their load manual from the ground up, Steve was the man who was assigned the task of developing loads for every cartridge in the new manual, using every bullet in the Hornady catalog and every powder known to Man (except talcum powder, of course!). He attended the Oehler workshop on testing loads and equipped the Hornady lab with Oehler test instruments, then developed and lab-tested far more loads than the Hornady manual contains. With that much experience, even a mummy or a cigar-store wooden Indian would learn a lot about handloading. Turning case neck walls to a uniform thickness does no harm if only the thick side of the neck is removed. Any more thinning can ruin cases, because the necks can not be reduced in diameter enough in a sizing die to hold a bullet. An ordinary rifle has a large chamber neck, so case necks, turned or unturned, never fit snugly. "The only real benefit to turning necks is when the cases will be used in a chamber that has a known exact fit to its neck," Johnson said. Other handloading steps may or may not contribute to accuracy. But if the busy work of a hobby makes you happy, then have at it. A friend of mine polishes the insides of his case necks with steel wool wrapped on a bore brush. He says that this procedure makes bullet release constant on firing and reduces velocity spreads. He polishes each case for ten seconds, not a second more and not a second less. However, for such an exact procedure, he does not specify the exact speed of his hand drill or the grade of steel wool that he uses. Johnson said that it's a good idea to check the consistency of handloads with a chronograph. "If for no other reason, a chronograph tells you what's going on with your velocity and that your handloads are safe," he said. "In my reloading classes, I tell people that squeezing that last possible hundred feet per second of velocity is not going to make a difference on any game animal or target." A load that shows uniform velocities shot after shot has possibilities as an accurate long-range load. Consistent velocity removes one variable from the accuracy equation. 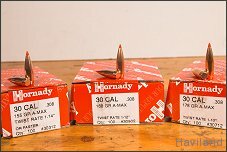 Say a .30-06 load firing Hornady 180-grain A-Max bullets varies in muzzle velocity between 2,650 feet per second (ft/sec) and 2,700 ft/sec. That 50-ft/sec spread results in slightly over three inches of vertical dispersion at six hundred yards and nearly five inches at a thousand yards. So by investing a little effort into finding a consistent load, a shooter can tighten his groups appreciably even before he fires a shot at a long-range target. "Still, I'd have to say the proof is in the pudding," Johnson said. "If you get half-inch groups at a hundred yards with a load that varies some in velocity, but one-and-a-half-inch groups with a load that shows very consistent velocity, go with the accuracy." Different rifles like different loads. Why this is true is open to constant and on-going debate. Perhaps the phase of the moon and the alignment of the planets determine a rifle's accuracy with certain loads. "Someone should do a doctoral thesis on that some time and find out exactly why that it is," Johnson said. "But for now, go with the accuracy." Millard said that he is far less meticulous in preparing his handloads than some long-range target shooters are. "I don't go crazy weighing and segregating cases," he said. "And to tell the truth, weighing a case doesn't tell you its volume, only how much it weighs. So maybe they should be measuring case volume instead." Millard doesn't measure every powder charge, either. A one-tenth or two-tenths of a grain variation in a sixty- or seventy-grain charge of powder is insignificant. "Still, it seems some guys have more fun doing all this busy work than they do shooting," Millard said. "But if all that work makes for good results on the range, than it's certainly worth it for them." Bullet-seating depth is one common adjustment. 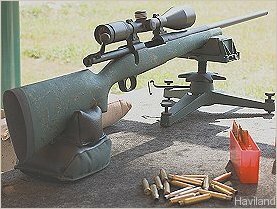 "I don't know if I believe it a hundred percent yet," Millard said, "but seating a bullet so it sits in the lands when the cartridge is chambered seems to improve accuracy in bench-rest shooting. That's because the bullet is then held in alignment with the bore." That is, if bullets were seated in alignment with the case neck and body to start. Millard said that when he uses a new sizing die, he checks to make sure that it sizes case bodies and necks so they are lined up with one another. "From there, I check how concentric bullets are seated with the neck," he said. "Some guys won't shoot loads with bullets more than one thousandth of an inch out of alignment. I've never really seen any accuracy difference with bullets out as much as two or three thousandths of an inch." Any more misalignment than that, though, can cause accuracy problems at a thousand yards. When Millard develops a load, he considers what bullet he needs for long-range target-shooting, and then what powders will drive the bullet fast enough to get the trajectory that he needs. At the moment, the 6.5mm-.284 is the darling cartridge of long-range target-shooters. Millard is working on putting the finishing touches on his new rifle chambered for the 6.5-06 Improved. "There are lots and lots of different cartridges in use, so it's still anyone's ball game," he said. All that preparation is a waste, though, unless the shooter knows what to do at the bench. Shooters who are new to the long-range game do well when the weather is calm. "But when things are constantly changing, it's the experienced shooters who shoot the best, because they are always reading the mirage and watching their wind flags," Millard said. When the right conditions occur, they'll shoot quickly to get their bullets down that long range. Johnson said that he's mainly a big-game-hunter. "So I consider any shot at or over three hundred yards as long range," he said. "It really doesn't matter what bullet it is or how fast it started out, gravity really pulls bullets out of the air past three hundred yards." Because Millard shoots at stationary targets while he's shooting bench-rest, he considers six hundred yards as the short end of long range and a thousand yards as definitely long-range. I'm mostly a hunter, so I decided to shoot targets at three hundred yards to see how the long- range game works. Besides, that's the farthest distance at the local shooting range. To find at least a few accurate long-range loads, I selected the Hornady 168-grain and 178-grain A-Max bullets. I paired the two bullets with a variety of powders in a Sisk custom .30-06 rifle. I developed the following loads with both bullets seated to sit 0.03 inch from contact with the lands. I checked the concentricity of the bullets and fired only those loads with no more than 0.002 inch of runout. Except for Reloder 19 and the 178-grain A-Max, those were pretty poor groups. In fact, I would be darn lucky to hit a deer in a vital spot at three hundred yards with those loads. Charlie Sisk told me that he used to think that bad scopes or poor barrels had caused many of the inaccuracy problems that he encountered. He said that he had replaced many barrels, when all along, the wrong primer was probably to blame for their inaccuracy. The first sign that primers may be causing the problem is a group that looks like two distinct groups with a noticeable vertical spread. He suggested that I try Federal 210 primers to see whether they helped shrink my groups. So I seated Federal 210 primers with the same four loads with the 168-grain and 178-grain A-Max bullets. At a hundred yards, two of the groups were smaller, and two were larger, compared to the first groups with otherwise identical loads. All four groups hovered right around an inch, and their vertical stringing was much less. At three hundred yards, vertical stringing was also reduced. However, three of the groups were larger, compared to those in the first go-around. The Caldwell Lead Sled is a wonder at absorbing recoil, but it does nothing to reduce or eliminate recoil. It often causes the rifle to shoot to a different point of impact, and ?with prolonged use ?can even crack or break the stock of a rifle with really heavy recoil. I started scratching my chin and thinking while I looked at the rifle on the bench. Maybe for the rifle to shoot its best, it needed a completely cleaned and cool barrel. The Caldwell "Lead Sled" that held the rifle on the bench and kept the rifle from sliding back in free recoil also made me wonder. Perhaps locking the rifle in place caused it to torque differently each time it was fired. That might have been the cause of the vertical stringing and the separate grouping. So, back home, I thoroughly cleaned the barrel. While the barrel soaked, I loaded more 168-grain bullets with Varget and Reloder 22. Back at the range, I set the rifle on a regular front rest and V-shaped rear sand bag. A strong headwind blew at a steady fifteen miles per hour. The first three bullets loaded with Varget landed in 0.305 inch at a hundred yards. As I gathered my toys to head home, I found four cartridges loaded with Varget powder. I carefully fired them at the three-hundred-yard target. They grouped in 1.93 inches. A lot of work and patience went into developing an accurate long-range load. 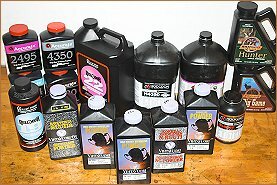 I spent hours on end handloading cartridges with a variety of powders and nearly four hundred bullets. Surely, if the rifle had been chambered for some sort of a high-pressure magnum cartridge, at least a quarter of its barrel life would have been shot away just searching for an accurate load. Checking the concentricity of the cases and bullets took a lot more time. But at least I was busy with that. I nearly went stir-crazy twiddling my thumbs while looking out the kitchen window day after day at the western sky, waiting for calm weather. Even when the wind was calm at home, it still blew at the range, which is right in the middle of a canyon. Doping that ever-present wind was always challenging. I watched which way the tall grass bent at different distances and tried to shoot only when wind was the same. I did that fairly well, apparently, because most groups had only about two inches of horizontal spread. The last time I shot at three hundred yards, though, the bullets struck the dirt bank behind the targets and threw up a big cloud of dust. That dust cloud showed how strangely the wind was behaving. After one shot, the dust cloud separated. Half went to the right, and the other half went to the left. The two dust clouds blew about thirty yards in both directions, then both dust clouds swirled a few times, then went straight up into the sky. I was at a loss to know how to compensate for such a capricious wind. All this shooting has shown me that seemingly minor differences in reloading components, cartridge assembly, and shooting form may not make much difference in accuracy at a hundred yards. But they can sure rear their ugly heads at longer distances. This shooting has also shown me that three hundred yards is long-range shooting, and few hunters have any business shooting at big game any farther away than that. It has also made me appreciate that thousand-yard shooting is the ultimate long-range target and handloading game. There's still a lot more to learn about all this, so there's more loading and shooting to do. Friend John can shoot ?at long range ?better than he lets on. Maybe we can get him to tell us, some day, about killing a prairie dog, on one of our Ramshot invitational shoots several years ago, at ?how far was it, John? ?over thirteen hundred yards, if I remember correctly. Using Black Hills factory loads, I believe. Luck? Some. Skill? Some of that, too. Persistence? Definitely a factor.